Akerson says GM has lost $16.4 billion in Europe since 1999. DETROIT (Bloomberg) -- General Motors directors praised Dan Akerson's performance as CEO while saying he must now fix the automaker's European operations and begin grooming a successor. Akerson's legacy -- and the board's -- will be shaped in large part by whether he's successful in turning around GM's European operations. Analysts have estimated it will cost at least $1 billion to restructure GM's German unit, Opel, and it may take years to stop the losses. "We have to wait until 2014 before we can close a plant and clearly that has to be done," GM director Robert Krebs said. Though former GM CEO Fritz Henderson had advocated selling most of Opel, Akerson helped persuade the board to keep it. That was the right decision, Krebs said. "We're going to fix it," he said, "so it becomes a low-enough cost producer so that it can survive in the bad times and make a lot of money in the good times." Akerson, who gave himself a 'B' grade during an interview last month, can stay on as long as he wants, directors Krebs, Neville Isdell and Patricia Russo said last week in separate interviews before the company's annual meeting in Detroit. GM regained the title of world's largest automaker last year, when it earned a record full-year profit of $9.19 billion. 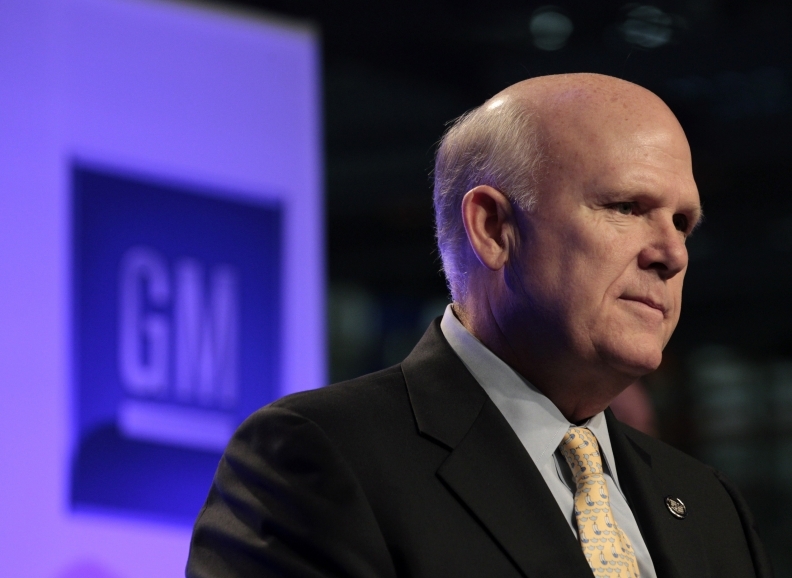 Even with those successes under Akerson, GM's stock fell 45 percent in 2011. Shares, including the U.S. government's 32 percent stake, have declined 33 percent since the automaker's November 2010 initial public offering, attracting value investor Warren Buffett's Berkshire Hathaway Inc.
"We're frustrated, but we don't sit around the board table bemoaning the price of the stock," Krebs said by telephone from Chicago. "We're in this for the long haul." About half of the company's directors, including Krebs, Russo, Akerson and his predecessor, Ed Whitacre, joined the board as the company emerged from its 2009 U.S. bankruptcy reorganization. Whitacre replaced longtime GM executive Henderson as CEO, then surprised the board when he said he didn't want to stay with the company long after the 2010 IPO. The directors turned to Akerson, a Navy veteran who had split his career between telecommunications and private equity. "I don't think we could've found anyone better," Isdell, former CEO and chairman of Coca-Cola, said in a telephone interview from France. Isdell, Krebs and Russo say they've witnessed a cultural change at the automaker, once known for management by consensus that was too slow and too cautious. "The company is a lot more externally focused and a lot more competitively driven," Russo said by telephone from New York. Walking out of the last GM board meeting, Krebs said he told Isdell that GM "isn't even the same company that we saw when it came out of bankruptcy." Isdell agreed. Akerson has found and promoted "very good people who know what's wrong and are dying to do the right thing," he told an Atlanta audience last month. Still, the CEO shouldn't be given too much credit for GM's stellar profits, because it was the company's government-backed bankruptcy, managed by Steven Rattner and Ron Bloom, that lowered the automaker's break-even point, said Maryann Keller, principal of a self-titled consulting firm in Stamford, Connecticut. Last year's market-share gain -- GM added half a percentage point in the U.S. -- was aided by Toyota Motor Corp.'s production shortfalls caused by natural disasters in Asia, said Keller, a former Wall Street analyst. GM faces increased competition from a resurgent Toyota as well as Volkswagen AG, which has aggressive global growth goals, she said. "How's he doing for somebody who didn't know anything about the car business when he took over? I suppose OK, but you're measuring against that criteria," Keller said. Akerson has been successful in building a strong senior management team, from which he should be able to groom a successor, said Russo, the board's lead director. She said research suggests external successors make sense for companies needing change. "I don't believe that's the case for GM at this point," said Russo, a former Alcatel-Lucent SA CEO. "I would hope that when the time is right we've got a sufficient bench to be able to find the right successor." Vice Chairman Steve Girsky, 50, North America President Mark Reuss, 48, and Senior Vice President for Global Product Development Mary Barra, 50, have been mentioned by Akerson as possibilities. It isn't a choice the board expects to face soon. "I've encouraged him to stay long enough to find a successor in the company and to get the board comfortable," Krebs said, estimating it would take "a couple years." The agenda for GM's annual meeting tomorrow in Detroit includes re-electing all 12 directors, including Akerson, and adding two new members: Jim Mulva, 65, former ConocoPhillips CEO, and Tim Solso, 65, retired CEO of Cummins Inc.
"Costs are still too high," Krebs said. While GM's operating margins are about 5 percent, he'd like to see that nearly double to the level that both Volkswagen and Hyundai are posting. "We're envious of the financial results those companies are turning in." About half of the gap between GM and those rivals is because of Europe, where GM has lost $16.4 billion since 1999, Akerson has said.